In June 1975, the Victorian Society of St Vincent de Paul’s first soup van, a humble old Ford Transit wagon with doors which flew open when they took a corner, started offering friendship and food to the homeless men, at that time mainly affected by alcohol abuse. It was initiated by a group of young people wanting to serve the homeless community around inner Melbourne. 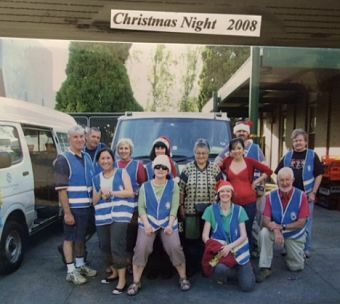 Now, after more than 40 years of operation, the Fitzroy Soup Van has never missed a night. 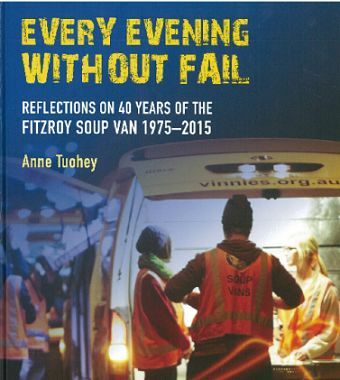 The new book by Anne Tuohey, Every evening without fail: reflections on 40 years of the Fitzroy Soup Van 1975-2015, captures some of the insights, hopes, challenges, and changes over its history. Most importantly, the book describes the special relationship between the ‘Vannies’ and the men and women they met. While obviously important, the food was a conduit for conversations which can lead to valuable relationships for people whose most pressing need is for human connection. The book records the accounts of volunteers known as ‘Vannies’, as well as of their friends, the people they serve, drawing from a rich archive of old newsletters and photos. Several Vannies who have remained throughout the van’s history, or returned for a second innings, contributed detailed recollections of the early days. These paint an important picture of the changing face of poverty and homelessness through processes of deinstitutionalisation, gentrification, and the increasing demand for affordable and secure housing. It is also a trip down memory lane for Melbournians, with references to the controversial ‘yellow peril’ sculpture, old-style doss houses like The Gill, and private hotels no longer operating. It also shows how increased vigilance in the risk-containment philosophy has changed the way the service is operated. In the heady early years, Vannies went looking for people, entering squats, and walking through parks and alleyways, often in the black of night. Today, the service is much more regulated than in those days, with fixed street stops, and visits to only a few boarding houses. ‘Hi-vis’ vests and a strict food-handling regime are now the order of the day, and the safety of Vannies is taken very seriously by the Society. Today, the Society also operates other soup vans across the State and is always open to exploring the feasibility of new ones where there is a need. On its own, the Fitzroy Soup Van is a mammoth operation, involving organising rosters, recruiting and inducting new volunteers, developing and promoting operational policies, and maintaining the current fleet of four purpose-built vans. There are many poignant stories; caring and grieving are a big part, particularly when considering some Vannies have been serving their friends on the street for thirty years or more. There is also a great deal of humour, both as an antidote to confronting times and to build reliable and close-knit rostered teams. At its heart, the story is relational, and describes the spirit which lives on from the early days. The approach may have changed, but the more than one hundred volunteers who make up the weekly roster are motivated to keep coming back every week, through Melbourne’s at times confronting weather, and regardless of other pressures in their lives. The book explores the challenges for such an outfit in remaining true to its original aims, while adapting to change, embracing corporate partnerships and their marketing realities. As one long-term Vannie expressed it, he hoped that one day he would no longer be needed, because society would finally have done what was needed to end poverty and hardship. Until then, the Fitzroy Soup Van will be going about its business every night without fail. Copies of the book can be obtained from St Vincent de Paul Society Box Hill 03 9895 5800.